Fall fashion is one of my favourites, the layering, the darker than usual shades, the coats and gloves; everything becomes a lot more glamorous when the air is chilly out. With Fashion Week well underway and arriving in London today, we are bound to see a lot more press around the trends being displayed in the catwalk and the ones which are expected to be huge this season. Here are 5 trends (I'll bring part 2 in a later post ) we should keep an eye on and why not even try to style. Think ruffles, bell sleeves, transparent fabrics and flowy silhouettes in both day and evening pieces. This style is slightly retro yet modern, and a long dress is the perfect piece to try this trend with. Speaking of ruffles, they were big at the beginning of the sunny season and they aren't going anywhere this fall, and if anything they are bigger than ever. 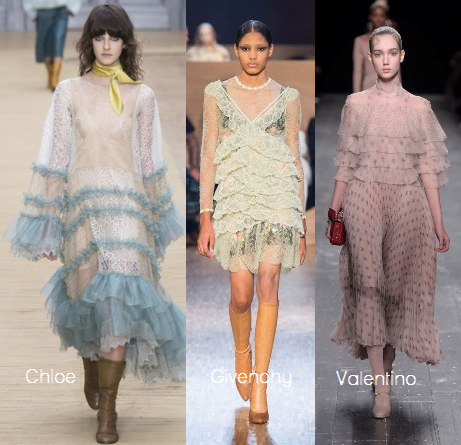 This trend is delicate and feminine, ideal for dressier nights out when you wish to add a romantic vibe to your outfit. 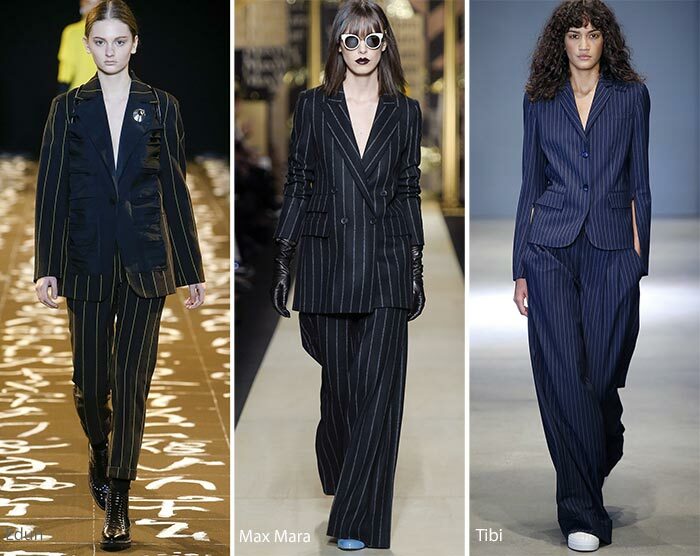 As showcase by Max Mara, the pinstripe suit is back in fashion (but not for your dad). This is an extremely wearable trend as vertical striping tends to slim and lengthen every body shape and it is bound to make workwear a lot more interesting than usual. 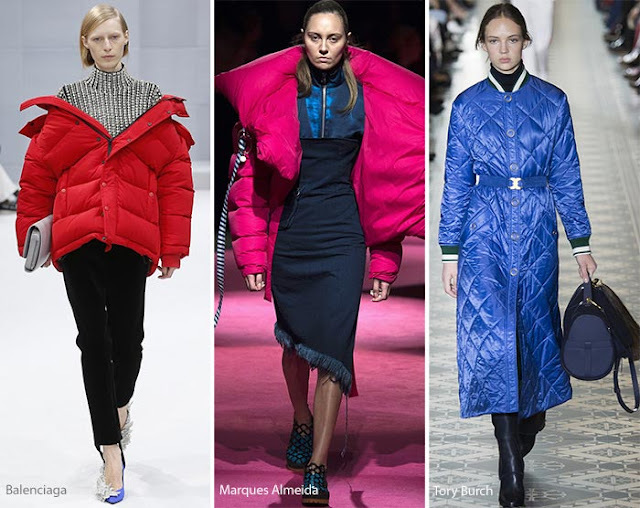 I never thought puffers to be very fashionable but the catwalks have spoken and a puffa jacket is are now THE only coat you will need in your wardrobe for fall thanks to this refreshing trend. Pair it with evening wear and you have a fresh and unpredicted pairing. And last but certainly not least, my favourite of them all; velvet. This is THE fabric of the season and I'm happy to report I've already added a few pieces to my wardrobe which I can't wait to wear. Velvet is chic, easy to wear and if you want affordable yet amazing pieces to embark on this trend, Zara is the place to go to. 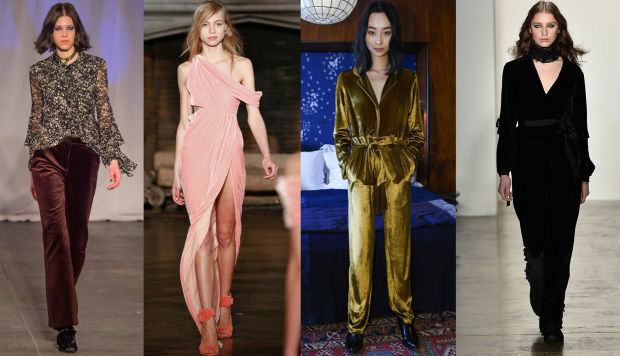 Think velvet camis, dresses, pants and even shoes; velvet has no limitations this season. What are your thoughts on these trends and which one is your favourite? Let me know below! Thanks for reading beauties and wishing us all a nice weekend ahead! Os looks da primeira imagem são bem giros! Give me all the top ones! I love that kinda style! Ohh excited now! I can't wait to see all the new in! Ruffles forever. <3 Nice post! Have a great weekend. I think my fave trend is the ruffless, but I want to try a little velvet. Ive never worn it before. I wish I was going to LFW. Definitely next year though. I couldn't get into any of these trends at all and frankly it's the first time that I am not feeling it. I look forward to part 2 though, maybe I'll like it better. I have seen a few amazing velvet pieces but it's just too high maintenance for me. I am biased, dear Pam, because I love velvet, ruffles, stripes and above all, autumn and winter :) I think you are right, it makes all more glam! I am eager to wear some lovely pieces again! Hope you have a very sweet day! as listras são as minhas favoritas. Nice Post! I am so excited about the ruffle trend! I'm loving part one Pam. Bring on the velvet, ruffles and sleeves. Puffer jacket I am yet to try, not a fan but will try. Enjoy London. 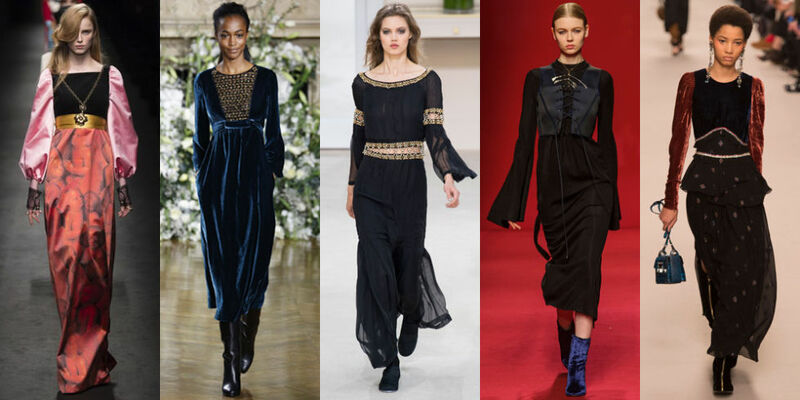 I've been reading some Fall trend reports and yes, velvet is THE fabric of the season apparently. That's great because it's a very wearable trend! ;) Pinstripe suits were also huge on the runways, I'd love to try that trend, it looks quite interesting. Thanks for sharing this helpful guide, dear! Que maximo amei , bom final de semana, obrigado pela visita. Loved reading this. Please check out my latest style book! I'm not massively into any of these trends myself but I love these round up posts Pam! My friend will have a heart attack if she starts seeing velvet in the shops now - she absolutely hates the feel of it haha! Que inspirações fantásticas, gostei bastante. Hope you're having a great weekend :) Stop by my blog, I've got two giveaways on at the moment! I love the Renaissance inspired looks, so dark and mysterious! You know, I had a velvet skirt that I'm not quite sure what I did with...I hope I can dig it out of a fall box somewhere! This post has me dreaming of ways I could wear it. Hehe, gotta admit, I'm also intrigued with experimenting with the ruffles trend too. Nice round up Pam!